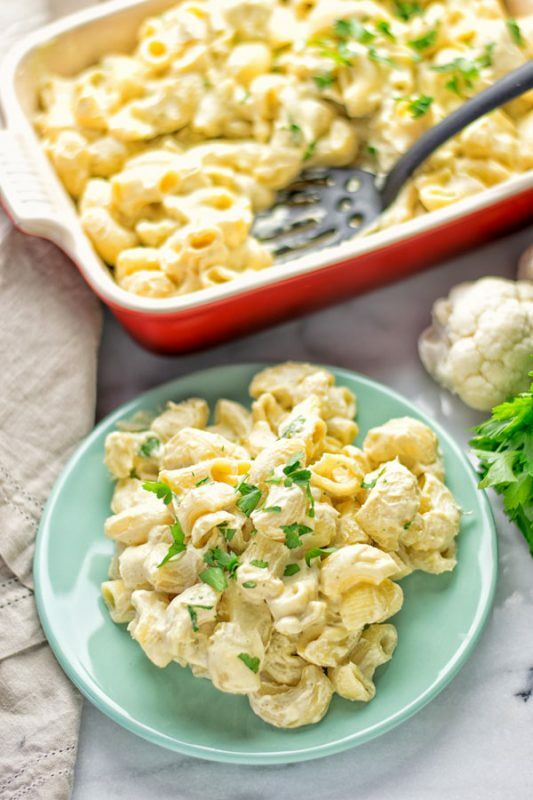 A Cauliflower Mac & Cheese that is entirely vegan, gluten free and so delicious that it’s out of this world. The ultimate comfort food, everyone loves this, you’ll never get bored or tired of it. It’s timeless and a winner always. 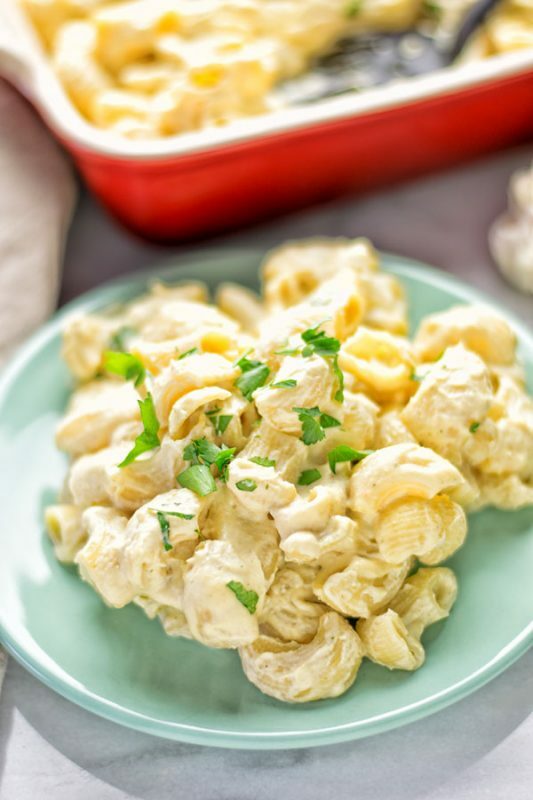 Is there anyone who does not love a comforting plate or bowl of simply delicious Mac & Cheese? Yeah, thought so. It’s among everyone’s favorites. For sure it’s one of mine. You can see proof for this love already with this amazing version of a Mac and Cheese Pizza. Two comfort foods in one dish that you shouldn’t miss. But today I bring you another amazing recipe. 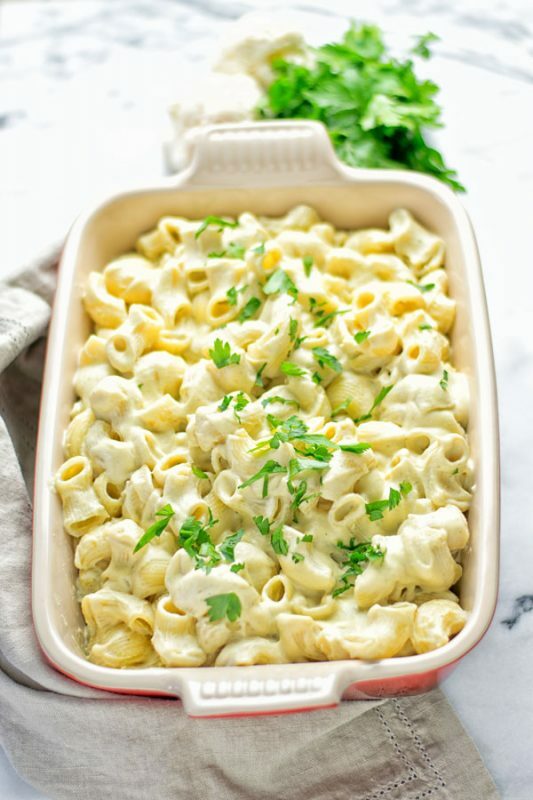 This Cauliflower Mac and Cheese is absolutely creamy, addictive, veggie packed thanks to cauliflower, full of mouthwatering flavors, comforting, extremely satisfying, incredibly easy, cheesy and the best mac and cheese you’ve ever made and tasted. Combine all the ingredients from the mustard sauce (mustard, maple syrup) in a blender together with the other ingredients from the 3 Ingredient Vegan Cheese Sauce (cashews, vegetable broth and tahini). Add next the roasted or cooked cauliflower florets, peeled garlic, and nutritional yeast to the blender’s bowl, season with salt and pepper. Blend until really smooth and creamy. After pasta is cooked, drain and put it back to a casserole dish. Mix with sauce, warm for around 3 minutes. Divide on plates or bowls. 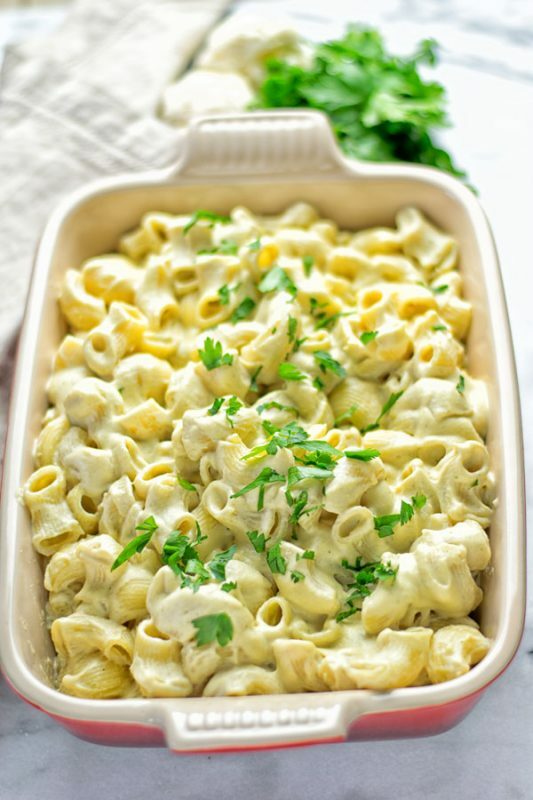 Also you can make a baked Cauliflower Mac & Cheese as well. Just combine pasta and sauce into a baking casserole and bake it for around 10 minutes at 405°F. 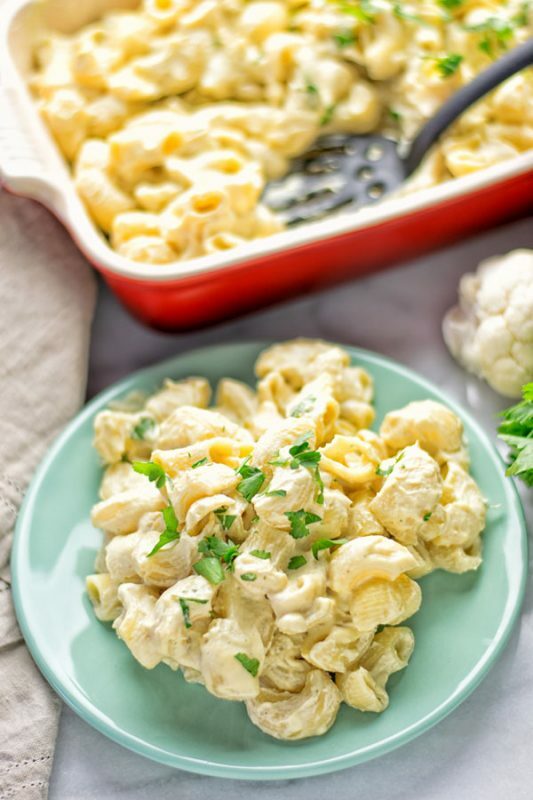 I made this Cauliflower Mac & Cheese with roasted cauliflower, which is my favorite. Simply because roasting it adds more flavor than just cooking it. The roasted flavors really add another level to this dish. For roasting there are different methods you can do it. For all you will need a baking dish or baking sheet with or without parchment paper. You can cut the cauliflower into florets, or use them pre cut from your store. Season with salt and pepper. You will need parchment paper if you make it without oil or vegetable broth on the baking sheet. I like my cauliflower with a bit of olive oil, so no need for a parchment paper. All that it needs is roasting at 410°F for around 15 minutes. I find out this is the right baking time for the perfect texture. If you’re going to roast your cauliflower, I made it often that I add the peeled garlic after 10 minutes and roast them for the last 5 minutes which adds so much flavor as well. There are so many more possibilities how to prepare cauliflower: You can cook cauliflower by adding the florets into a sauce pan with water seasoned with a pinch of salt. Cook them for 15 minutes. Also you can steam cauliflower. You can use your steamer for the microwave. How much water you will need will depend on your steamer but it should be done in 10 minutes. If you have a steamer that you put on top of a casserole when using the stove top, check the manufactures directions for precise instructions. You see there are many easy methods to prepare vegetables, which will depend on your own taste and preferences. In any case, make sure to wash and clean your cauliflower for any method. Let’s have a fun view about cauliflower’s nutrition values. It’s high in vitamins C, K, and B6. It’s an immune booster, and full of minerals like Thiamin, Manganese, Magnesium, and Riboflavin. Even protein in cauliflower is a thing, that for real we wouldn’t expect, but it’s a good protein source. Cauliflower also prevents oxidative stress, thanks to it’s high amount in vitamin C, manganese plus other oxidants to nourish the body. 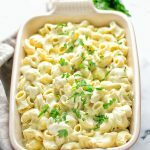 If you give this Cauliflower Mac & Cheese a try, show me your remakes with a picture and a tag on Instagram and Facebook. First cook your macaroni pasta according the manufacturer’s directions. 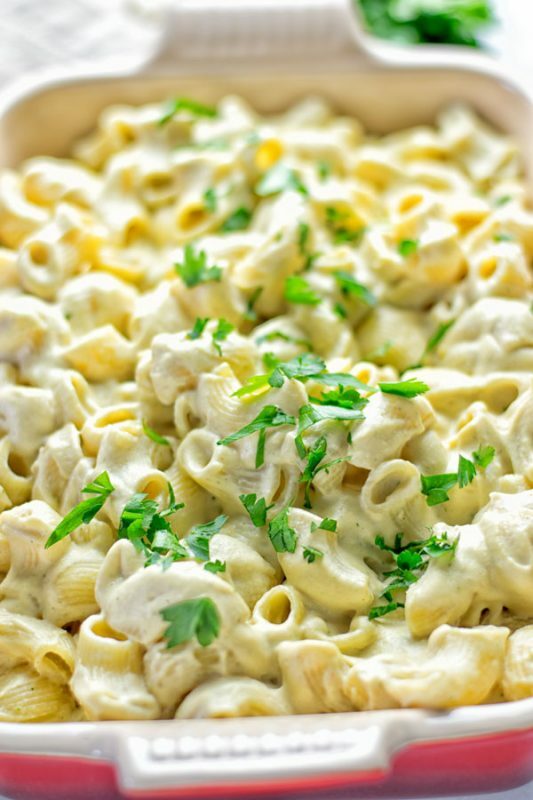 While the pasta is cooking prepare the sauce: combine all the ingredients from the mustard sauce (mustard, maple syrup) in a blender together with the other ingredients from the 3 Ingredient Vegan Cheese Sauce (cashews, vegetable broth and tahini). Add next the roasted or cooked cauliflower floret, peeled garlic, and nutritional yeast to the blender’s bowl, season with salt and pepper. Blend until really smooth and creamy. After pasta is cooked, drain and put it back to a casserole dish. Mix with sauce, warm for around 3 minutes. Divide on plates or bowls. This is the second time I made this (I figured out what to do with the nutritional yeast). Last time I didn’t like the mustard and maple syrup, so I left it out this time. Much better!!! Very tasty, I will make it this way again. Hi Marion! Thanks for sharing your amazing feedback and making it!